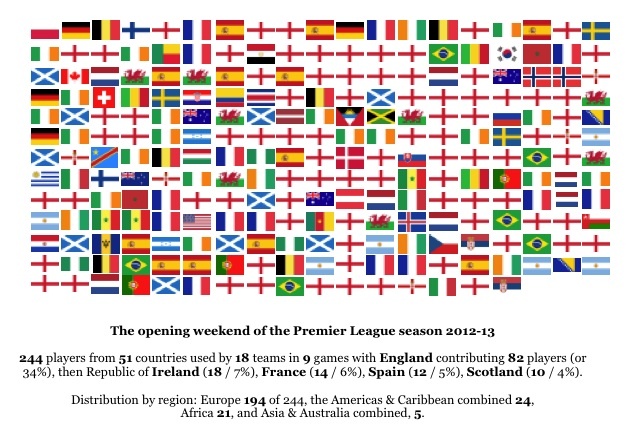 Each flag on the graphic represents one player involved in one of the nine Premier League games played on Saturday and Sunday, from Arsenal’s Polish goalkeeper Wojciech Szczesny at top left to Manchester City’s Serbian defender Aleksandar Kolarov at bottom right, Kolarov being the last sub in the weekend’s last game. In all there were 244 players from 51 different nations, with all continents represented. 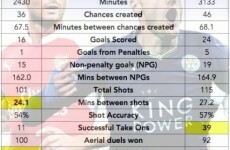 The Premier League, as a major success story in British sport, is a target for huge amounts of flak, never more so than in this London 2012 Olympic summer, when umpteen comparisons have been drawn between football and Olympic sport. The arguments are well rehearsed, and painfully dreary in many cases. Apples and chairs. What is not in doubt is the ongoing global appeal of the Premier League, and in large part that is down to its diversity. The graphic above is just a two-day snapshot. 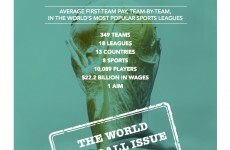 There are 568 players in first-team squads, from 72 different nations. The most nationalities used in a single season to date was 74 in 2009-10, then 73 (twice, in 2008-09 and 2011-12). Of the 568 players, 183 are black, 379 white and eight Asian (two of them British Asian, those two being Neil Taylor at Swansea, whose mum is Indian, and Neil Etheridge at Fulham, born and raised in London, whose mum is from the Philippines, for whom Etheridge also plays). Of all the players, 32.22 per cent are black. Of the 232 English players, 80 are black (or 34.48 per cent). Around 2 per cent of the general British population is black. In TeamGB at the Olympics, 57 of 541 athletes (10.5 per cent) were black. While the number of privately educated Olympians is falling (37 per cent of GB medal winners went to fee-paying schools, against 50 per cent in Beijing), Olympic athletes from private education backgrounds still massively outnumber fee-paying students in general (7 per cent of the population) which in turn outstrips football’s privately-educated players (hardly any). Arsenal’s first-team squad on the opening morning had 32 players from 19 nations, making it the most diverse in terms of most nationalities. The equivalent numbers at the other clubs: Villa 32 players /12 nations. Chelsea 27/12. Everton 22/14. Fulham 26/20. Liverpool 32/11. Man City 30/16. Man Utd 27/15. Newcastle 30/13. Norwich 28/5. QPR 29/13. Reading 28/10. Saints 30/10. Stoke 27/13. Sunderland 21/9. Swansea 36/11. Tottenham 28/12. West Brom 26/15. West Ham 28/13. Wigan 29/14. The clubs with the most English players: Southampton 21, Norwich 20, QPR 17 and Liverpool 16. The clubs with the fewest English players: Fulham 3, West Brom 6, Everton 7, Wigan 7, Arsenal 7. 1 Antigua&Barbuda, Austria, Barbados, Benin, Burundi, Colombia, DRCongo, CostaRica, Ecuador, Egypt, Faeroes, Ghana, Greece, Grenada, Iceland, Latvia, Macedonia, Montenegro, Oman, Philippines, S Africa, Slovenia, Togo, Trinidad & T, Turkey. Next article Openly gay Olympians won six times as many golds as their peers. Why?